insurance maximum – Hayden Consulting – Where Your Success in Business and Life Matters! Think seriously about how you can improve and grow your practice. Review your 2012 numbers and set new S.M.A.R.T. * goals for the New Year. Your team must know exactly what your goals and expectations are in order to do better in 2013. Who can anchor to an unanchored mind? We put together some dental marketing ideas and reminders for you for the month of January to help you start 2013 with a positive attitude that it will be your best January ever! 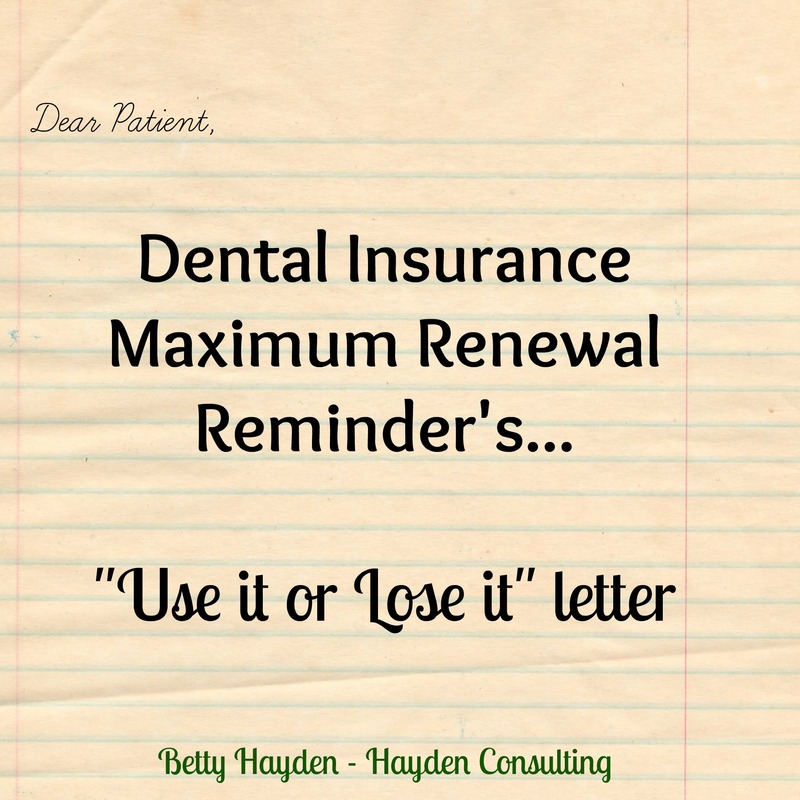 Insurance Maximums: Many of your patients dental insurance maximums renew on January 1. Phone your patients with a friendly reminder of their renewed benefits and make a reservation with them to come in for their hygiene visit or incomplete treatment with the doctor. Drinking Green Tea can improve dental health. Educational & Service Opportunity: Does Tooth Sensitivity hold you back from enjoying your favorite hot beverage? We can help! Educational Ideas: Blog, Email or Social Media Posts, and or Product/Service Features/Promotions for in the office. January 25 is Fun at Work Day – Endless possibilities here! Get creative and have FUN! We will be giving you new dental marketing ideas for each month, please subscribe to our posts so you don’t miss out on the dental marketing fun! Thank you! Ahhh, the start of a new year is just around the corner! A new year of helping patients create and maintain beautiful healthy smiles and one of trying desperately to reactivate your patients that have slipped out of care. For your patients that haven’t been in for one year or longer send this very successful We Miss You reactivation letter. If you haven’t been in because you are seeing another dentist, please let us know. That way, we can update our records and at least know you’re receiving your all important dental care. Plan now to make 2013 your BEST year yet! Hayden Consulting is ready to help you create a fantastic marketing plan that will surely exceed your patients expectations.